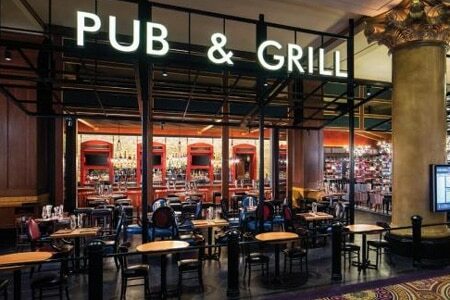 Located in the center of the Caesars Palace casino, Gordon Ramsay’s interpretation of an authentic English pub will transport you across the Atlantic. : All the accouterments of a British pub are in place here, with décor elements of a beer keg-lined wall; artwork paying tribute to the Tower of London, St. Paul’s and Big Ben; a bar showcasing 36 beer taps; and traditional British red telephone booths. A bit of whimsy is thrown in via the hostesses’ dresses, made to resemble newsprint packed with both real and fictitious articles roasting Gordon Ramsay. The pub menu, served after 4 p.m., features beer-braised short rib, grilled lamb T-bone and rib-eye; and a side not to be missed, the sautéed forest mushrooms, enlivened by a poached egg. The lunch menu contains classics such as shepherd’s pie, onion soup and fish ‘n’ chips. On both menus, begin with the hellfire lollipop wings with chile beer glaze and bacon blue cheese dip. 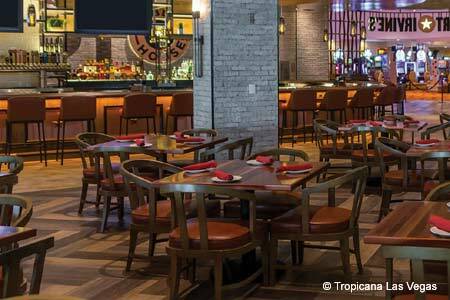 We like the eight-ounce grilled lamb burger with caramelized onions and goat-feta cheese spread; and the 12-ounce NY strip with choice of single malt peppercorn, brandy béarnaise, herbed compound butter or house-made steak sauce. There are 84 different beer choices to complement your meal, including Ramsay’s favorite from his Scottish homeland, Innis & Gunn. Finish with Ramsay's signature sticky toffee pudding with sweet cream ice cream.